Unusual circumstances landed us in the Hotel Amadeus in Sevilla, Spain. Normally, we are able to book our “top choice” hotel based on our research, because we allow for plenty of lead time. However, our plans for Andalucía solidified much later than our itinerary for the rest of our trip and by the time we decided to stay 2 nights in Sevilla, our first choice and a TripAdvisor.com favorite, Hotel Casa 1800, was booked solid. Luckily for us, Hotel Amadeus turned-out to be a very suitable alternative. In addition to a prime location in the venerable Barrio Santa Cruz neighborhood and spacious rooms, Hotel Amadeus offers unique common areas with musical instruments (their trademark), an unbeatable continental breakfast, and a beautiful rooftop terrace complete with Giralda views (see photo to the left), a bar, and a refreshing (albeit unheated) jacuzzi. Price. €185/night for 2 people in a junior suite. Breakfast was another €10 per person per morning, but well worth it (described below). Hotel Amadeus was the most expensive stay of our trip. However, we used loyalty points (SPG) in the more expensive cities of Madrid and Barcelona and decided to splurge on an upgraded room. In retrospect, we would have booked the much more affordable standard room (€112/night). With so many things to do in Sevilla and the outstanding common areas in the hotel, we spent very little time in our hotel room. The basic rooms in this hotel offer excellent value, considering the amenities and location of the Hotel Amadeus. Location. Hotel Amadeus is located in the Bairro Santa Cruz, the most enchanting quarter of Sevilla. It is within 5 minutes of the Sevilla Cathedral, which is reached from the lively restaurant-lined Calle Mateos Gaga. It’s nearly across the street from the popular Casa de la Memoria de Al-Andalus flamenco show. The Bairro Santa Cruz is conveniently positioned between the great shopping options near Plaza Nueva and the picturesque Plaza de España, both within 20 minutes walking distance. No doubt, we’ll want to stay in the same neighborhood on subsequent visits. Room. We upgraded to a Junior Suite based on photographs on the hotel website. Unfortunately, there at least two Junior Suite options at Hotel Amadeus, and the one we were assigned was not the same one that intrigued us from the website pictures. As mentioned earlier, we wouldn’t pay for the upgrade again, especially for our version of the “Junior Suite.” It was fairly spacious with a modern bathroom, but did not warrant a €73 premium over a standard room. Our particular room included windows that opened to a view over a small courtyard, but with no balcony. There were two small couches, a small desk, and and armoire. We had no complaints about the comfort of the bed. Hotel Amadeus offers a continental breakfast served in your room or on the rooftop. Their fresh squeezed orange juice and chocolate croissant were a trip breakfast highlight. Dining. For a hotel of its size, Hotel Amadeus has excellent dining options. A beautiful manned rooftop bar is open late and offers an assortment of wine, beers, cocktails, as well as a decent menu of appetizers. They also offer guests a continental breakfast for less than €10 that is very filling and includes tomatoes, cheese, fresh OJ, and a variety of pasties (including a chocolate croissant!). 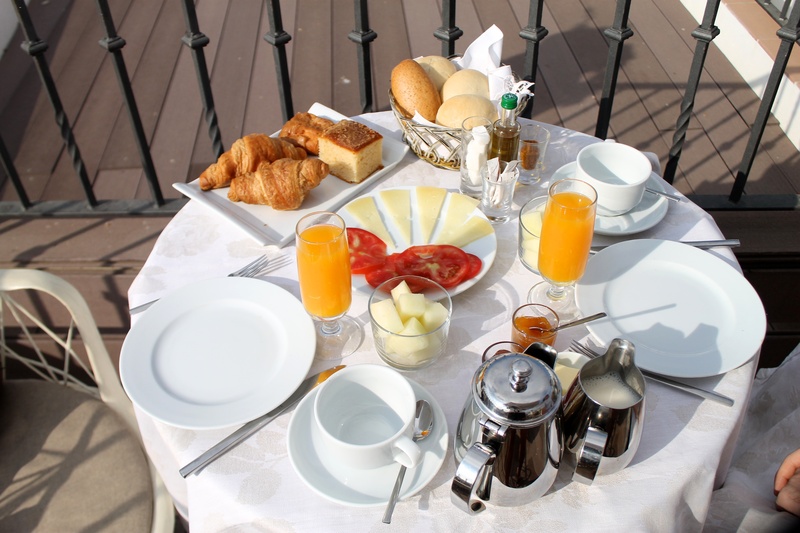 The breakfast is also available on the beautiful terrace, which offers great views of Seville. We recommend a shady spot, as the morning sun can be quite brutal. Amenities. Hotel Amadeus uniquely places a variety of musical instruments in public areas for the use of guests, inline with their musical theme. Although intrigued by the idea, did not see any people taking advantage of this amenity. However, many guests used the common areas for relaxation, as all were adorned with comfortable sofas and chairs. The rooftop terrace is also a great place to relax, with plenty of outdoor lounging chairs and couches. There is also a small jacuzzi on the roof that seemed unheated. A lukewarm jacuzzi fit the bill, however, after a hot day of exploring Sevilla. The Hotel Amadeus is a great option for Seville travelers. Although we could not justify the price of our premium room, their standard rooms offer a great value. 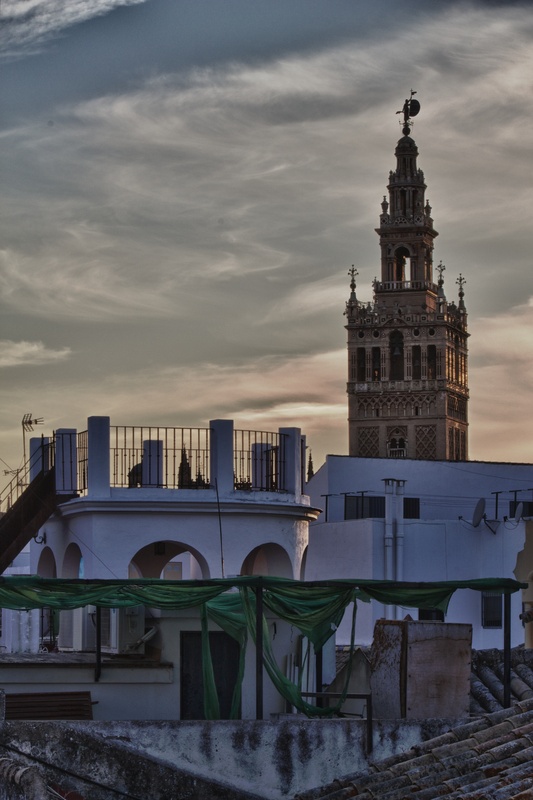 They are located in the most desirable neighborhood in Seville and offer guests great common areas, including a beautiful rooftop terrace with views of the Giralda Tower. 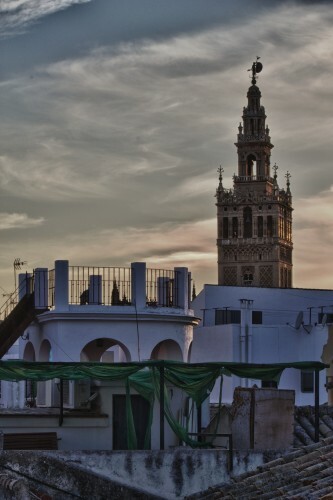 This entry was posted in Hotel Review, Travel and tagged hotel, Portugal/Spain 2012 Trip, Sevilla, Spain by Ryan. Bookmark the permalink.